Rhodiumised-steel Case set with 517 pieces brilliant-cut white diamonds, inner ring set with 60 brilliant-cut diamonds. Dial set with 134 brilliant-cut diamonds and crown set with a red agate cabochon, sapphire crystal, red mother-of-pearl dial, rhodiumised-steel sword-shaped hands. Hand-finished remborde alligator-skin strap, 18 mm steel buckle set with 31 brilliant-cut diamonds. 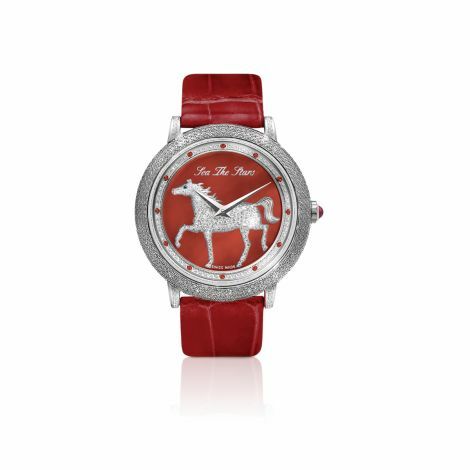 The Special horse design is created by Hubert de Watrigant who has worked for Hermès on a regular basis since 1989 and is one of its iconic illustrators. This unique watch is designed for those who are looking for excellence of style and performance that can be worn on any occasion.